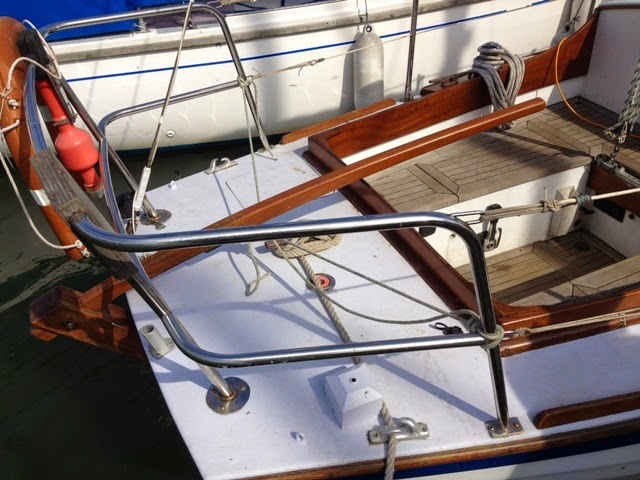 This 19’ 9” two berth cruiser offers a lot to boast about, including top quality fittings in brass, bronze and galvanized steel. 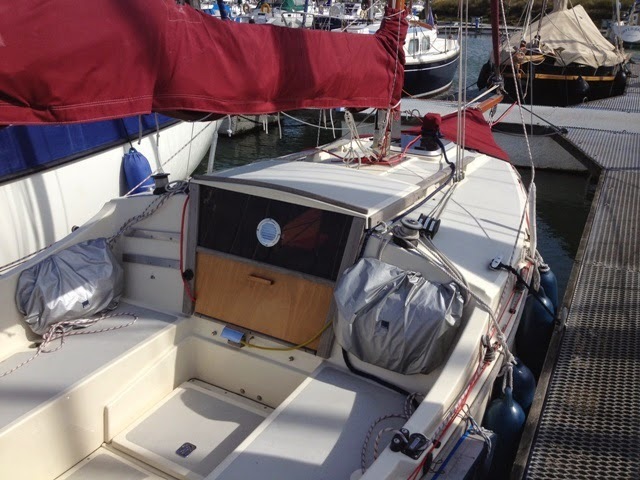 Robustly built of moulded GRP she has safety features such as a well in the foredeck for anchor work, a furling Genoa and a centreboard that can be operated from the cockpit. 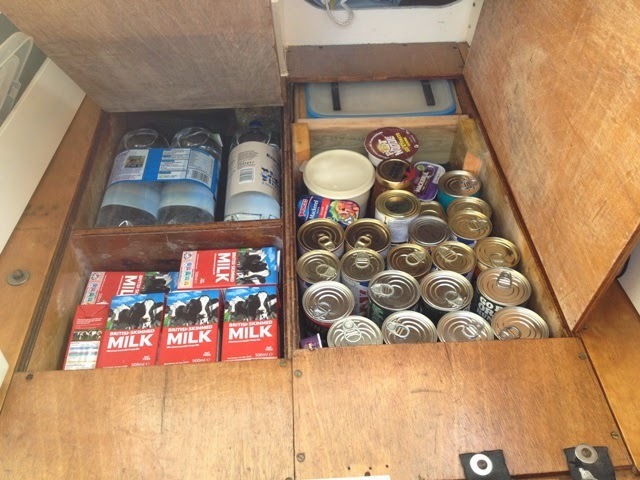 A more than adequate stainless steel pushpit adds to security for her crew. 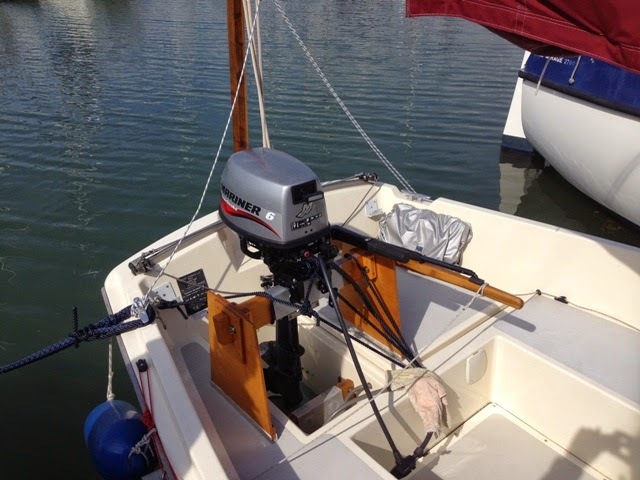 Prospective owners of new boats have a choice of a diesel inboard or an outboard engine in a well. 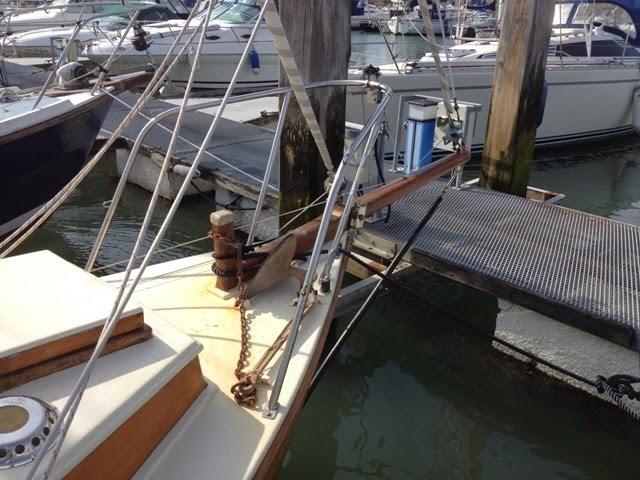 I have a feeling the boat featured here has an inboard engine. 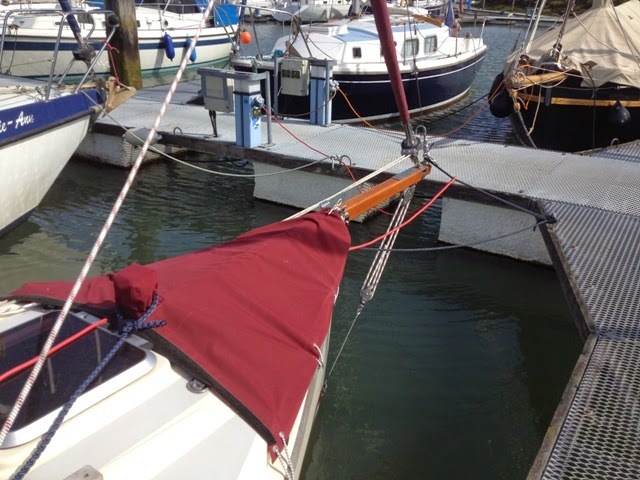 Advertised by the builder (Neil Thompson Boats) as a Gunter rig sloop, strictly speaking she has a high-peaked gaff, slab reefing mainsail. 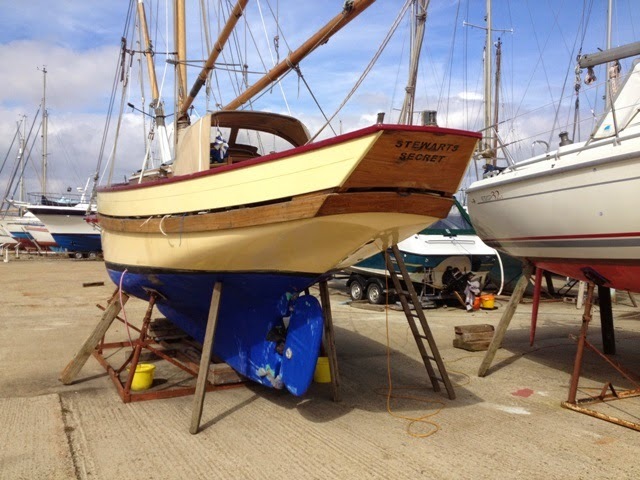 She was designed by Andrew Wolstenholme in 1989. 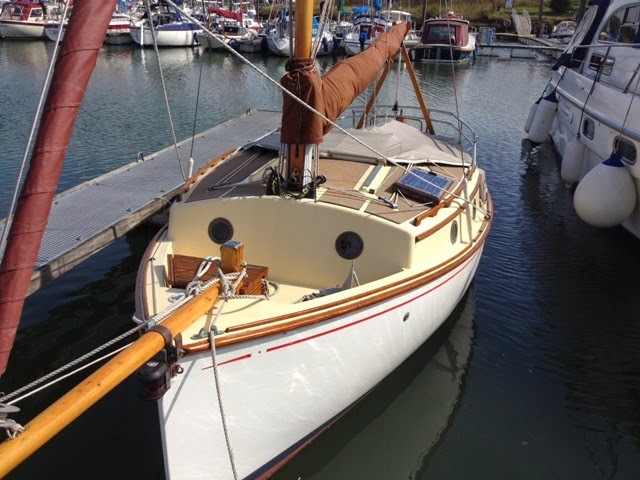 I have not been able to positively identify this delightful small sailing cruiser, but she is similar to an A. F. Platt Finesse 21. The Finesse 24 would appear to have a higher cabin trunk, and differently shaped ports. 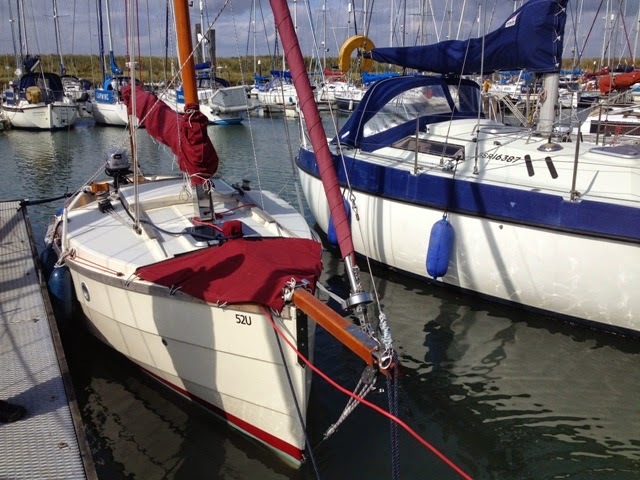 ‘Drifter’, the boat featured here, has running backstays, whereas a Finesse 24 has standing backstays, and the former has been fitted with a bowsprit, making her a cutter. 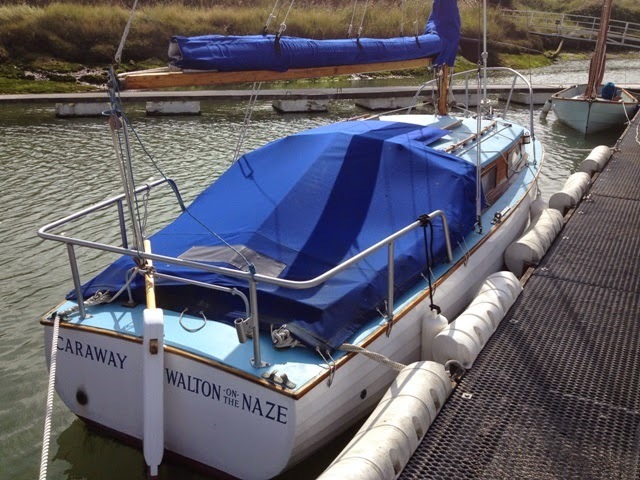 ‘Sea Bear’, the Finesse 21 for sale* at Watchet, has a single backstay and three shrouds either side. 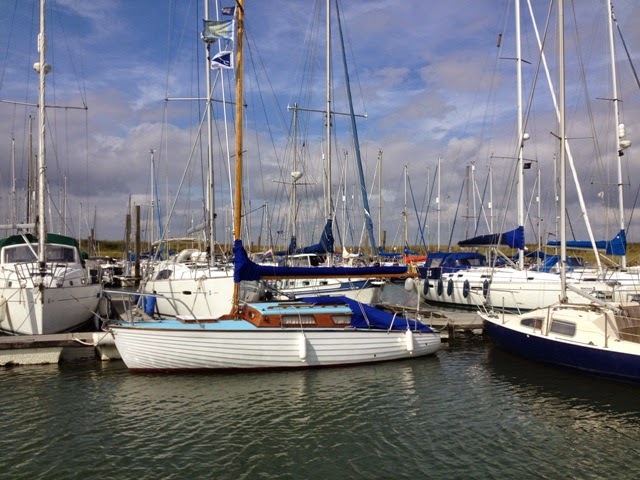 The two boats look very much alike. 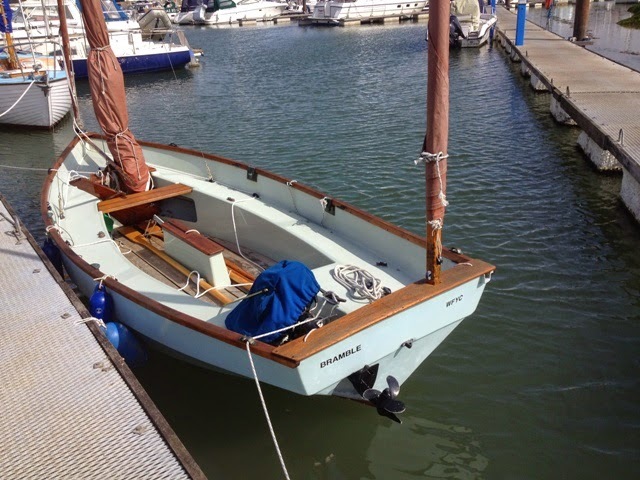 This sort of sturdily constructed vessel with a centreplate and bilge runners is ideal for the shallow waters of the East Coast. 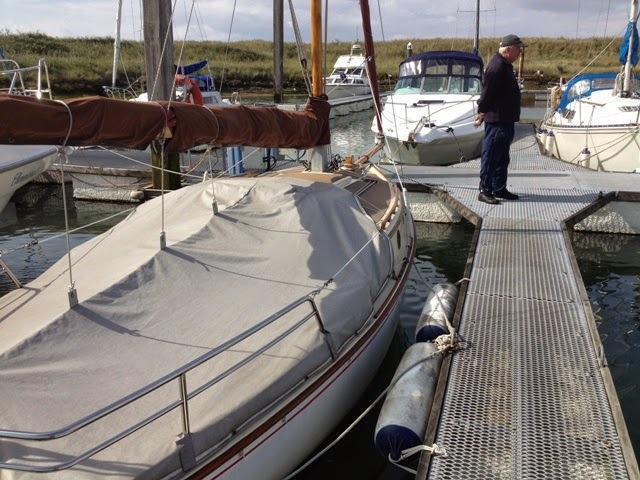 To own a new sailing boat these days you have to part with a fortune. 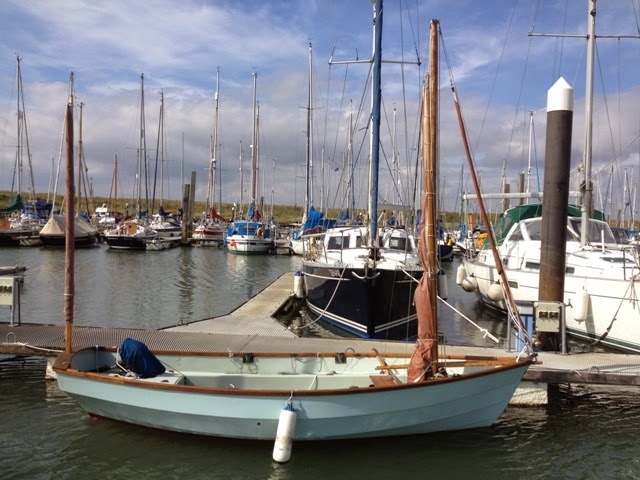 A 19’ Cornish Shrimper will set you back £24,950 inclusive of VAT, and that’s for the outboard version. 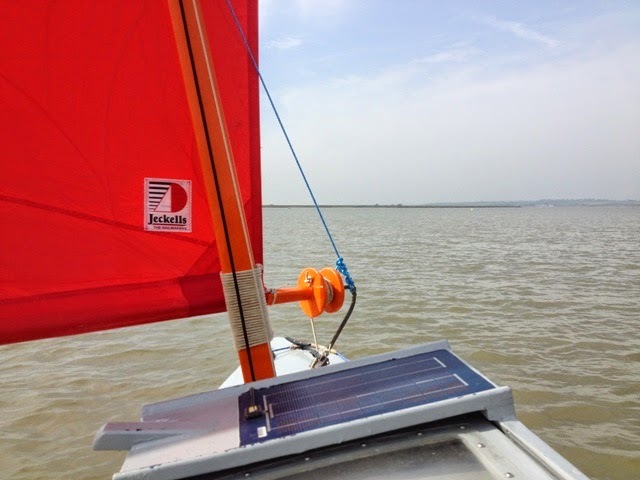 The inboard model will require £33,600. 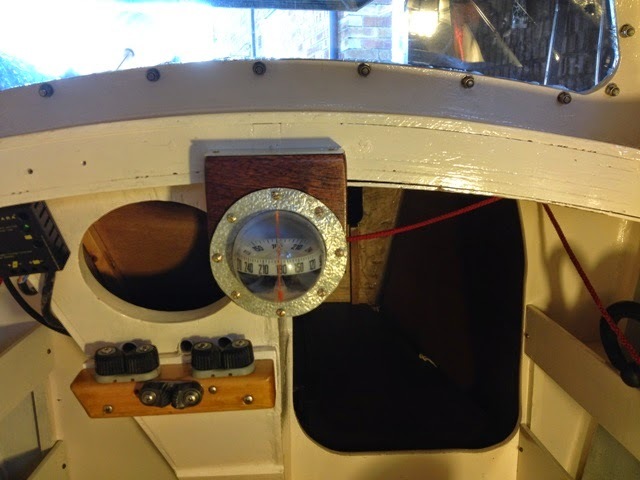 To either boat it would appear you have to add the cost of a trailer, probably requiring another £1,500, and there will be various bits of chandlery to acquire such as a steering compass, an additional anchor, warps, fenders etc. 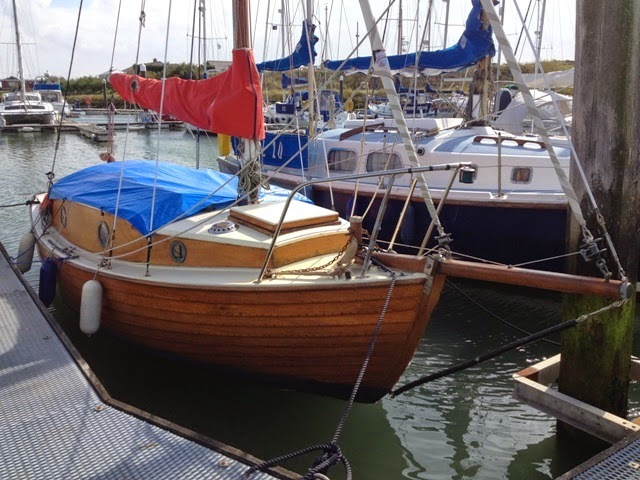 With this one (not for sale) seen at Titchmarsh Marina, the owner has devised a plywood support for her four stroke Mariner 6 outboard engine to suspend it above the water while in the marina. 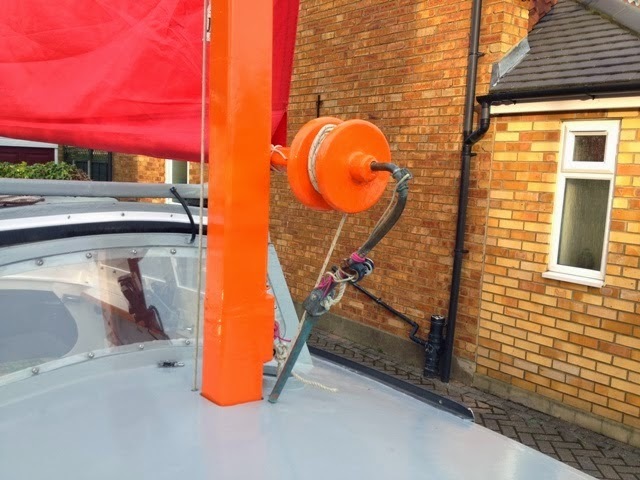 This will prevent weed and other growth from attaching itself to the shaft and prop, and also it will eliminate damage to these parts by electrolysis. 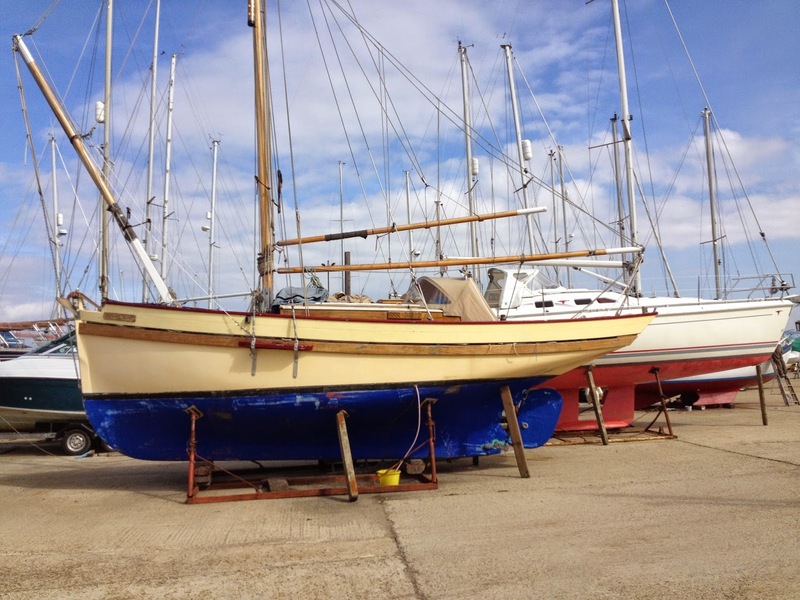 A second-hand Shrimper with all the bits and pieces, including a trailer, would require between £11,000 and £13,000. 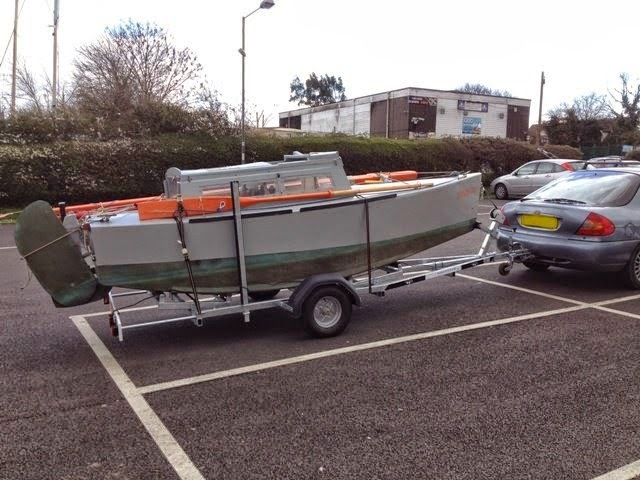 A new Drascombe Dabber without a Mariner 3.5 HP recommended engine will set you back £11,475 - that’s without a road trailer which will cost a further £1,500 inclusive of VAT. 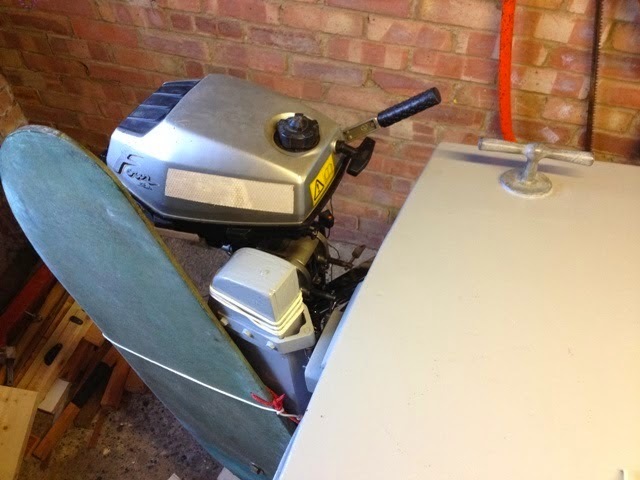 Add to that the cost of a new outboard amounting to about £600 the total outlay would be £13,575! 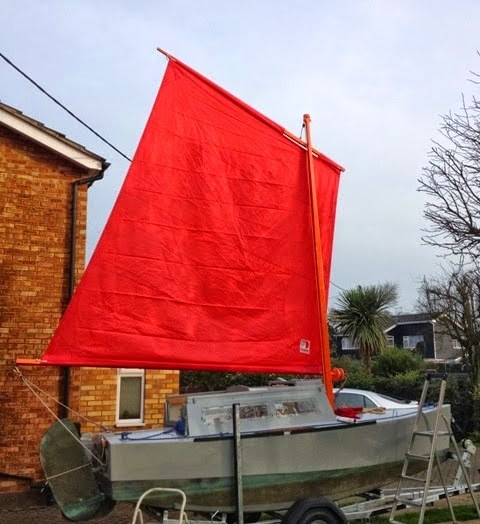 A used Drascombe Dabber with all the bits and pieces, including a trailer and engine may be had for as little as £3,500. 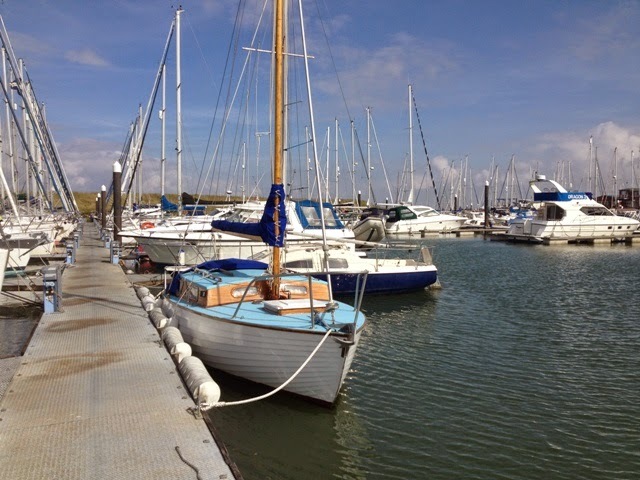 I saw ‘Bramble’ at Titchmarsh Marina. As far as I know, she is NOT for sale. 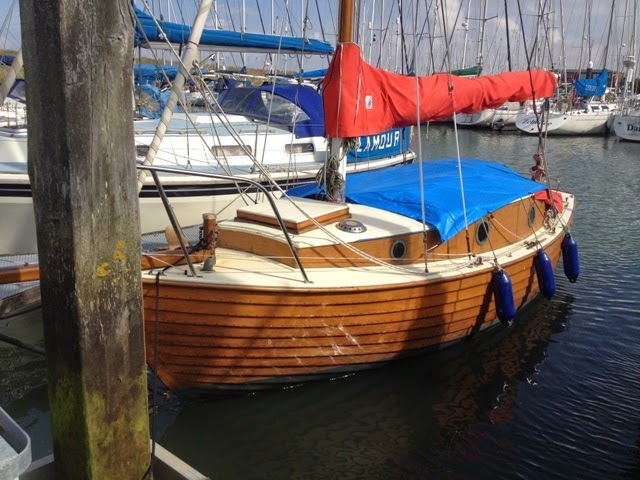 The original* wooden clinker Kestrel was designed by F.J. (Jack) Jones, for construction in mahogany on oak. 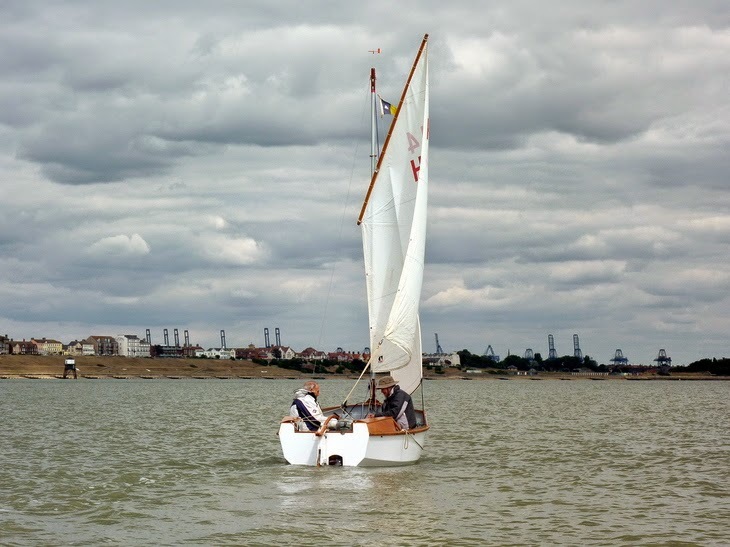 Some were fitted with ballasted keels and other had centreboards. They were first built in 1955. 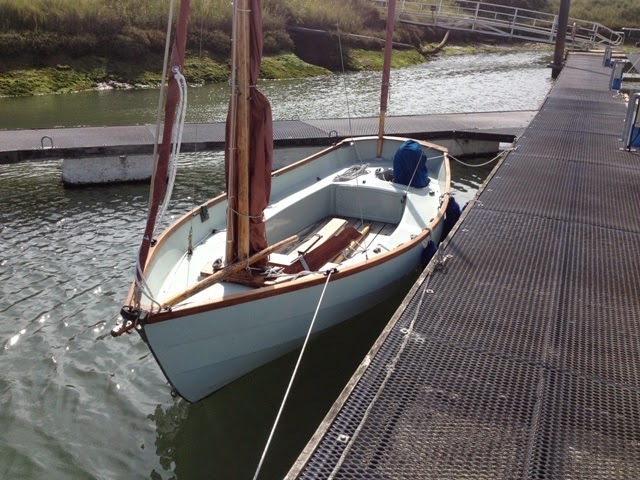 ‘Caraway’, shown in these photos, must have been a fairly early boat, because she has the basic coachroof without the extended forward section that was added to later boats. 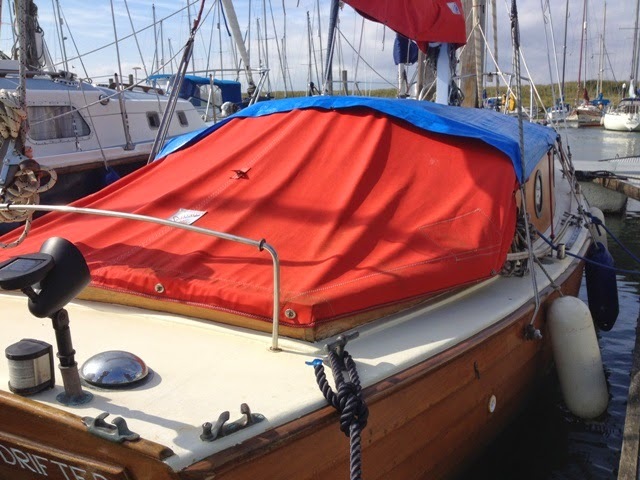 She also appears to have an inboard engine. 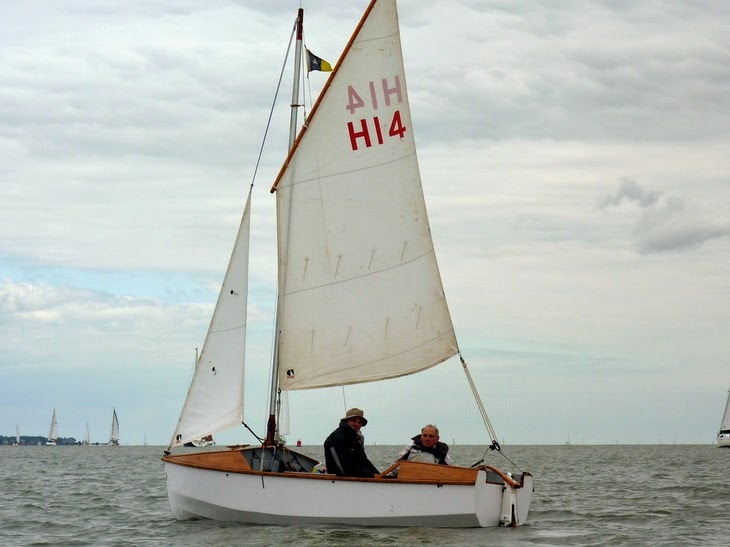 These attractive vessels were built by a number of builders: F. Halls and Son, of Walton-on-the-Naze, commenced building them in 1956 with 36 to their credit, and I know that at least one was built by C. D. Pugh, of Barry, South Wales, namely ‘Bluebell’, with sail number 103. 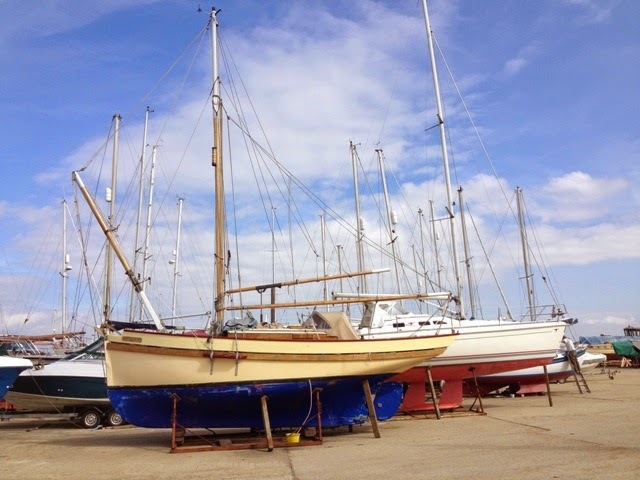 I’ve heard it said that at least 300 were built, and a good many of them in the ‘Kestrel Shed’ at Robertsons Boat Yard, Woodbridge, Suffolk. That was in the late 50’s. 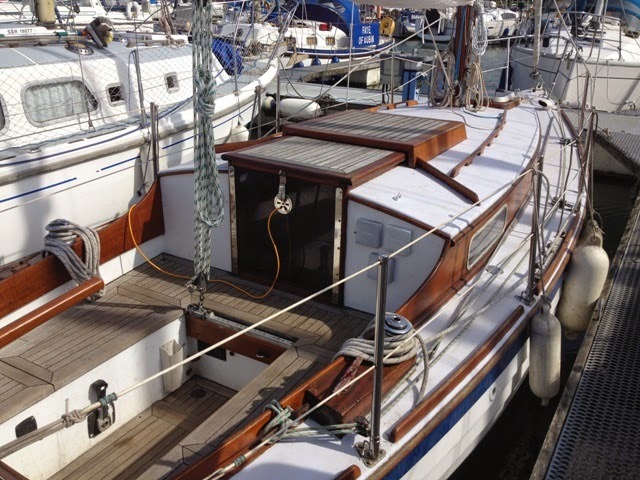 There were variations of the internal layout, according to the requirements of prospective owners. 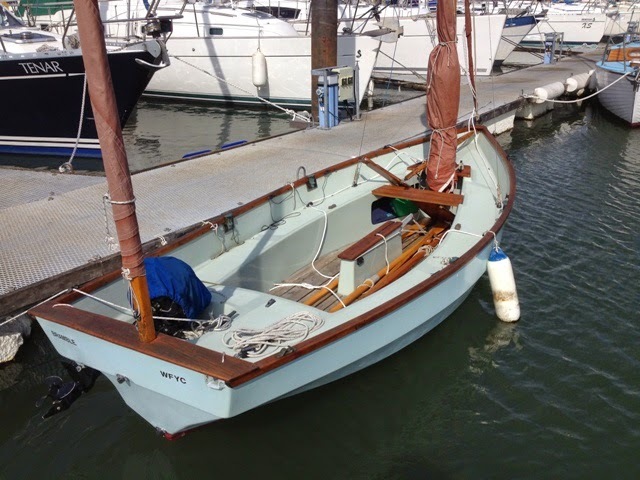 The first GRP Kestrel 22 was ‘manufactured’ in the late 1960’s. 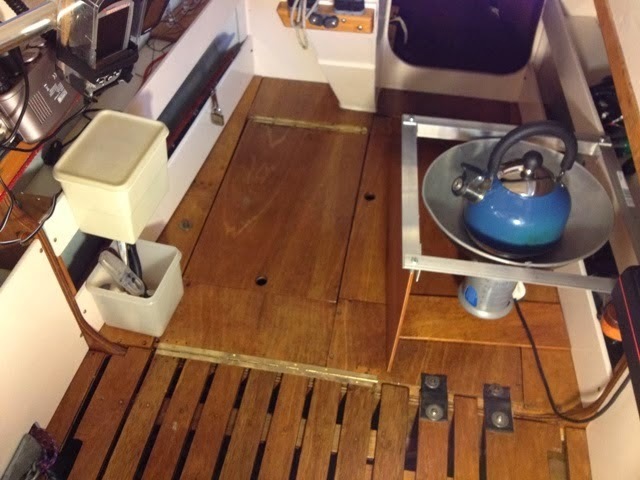 No longer was she a clinker boat, and her upper raised deck moulding, along with an extended coachroof, vastly increased the internal volume for improved accommodation. 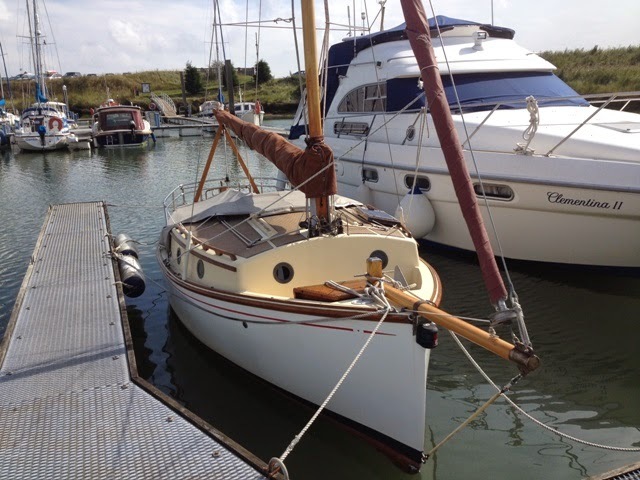 Personally, I think the GRP version is ugly by comparison with Jack Jones’s original, elegant clinker yacht. Frank Halls and Son Ltd. Here we are again. Somehow I cannot avoid this boat. I first saw her in 2010 and she continues to fascinate me. In my most recent article about her I was very scathing; I could find little of merit to say about her, but one thing I know, she has a beautifully crafted interior that is in pristine condition. Unfortunately, although she has ample light below from her many ports, these are of no use when it comes to seeing what’s going on outside, except perhaps to gain glimpses of the sky. 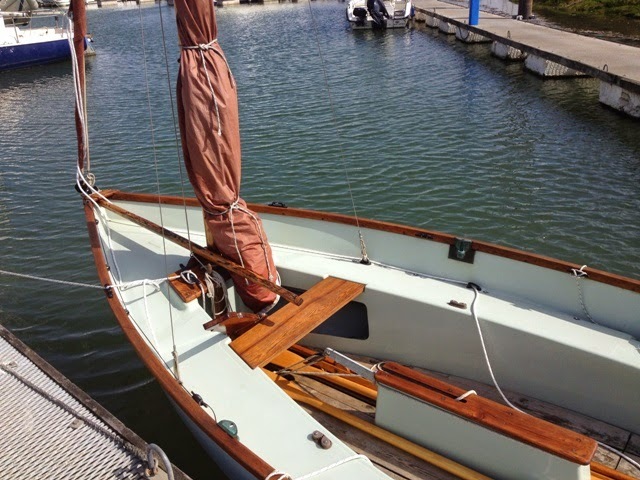 The first time I saw ‘Skylark’ I thought she would be weatherly because of her deep keel and twin rudders, but later I changed my mind because I discovered that I could make her roll by repeatedly pressing a side deck with my fingertips. 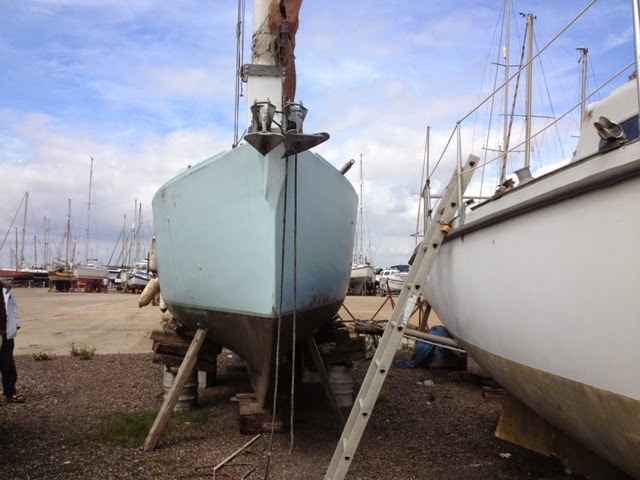 The heavy, rather thick mast helped induce a rolling action like that of a pendulum. 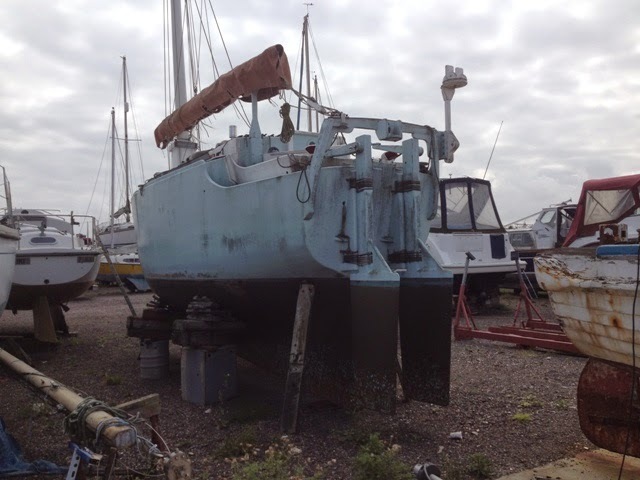 Having been left open to the elements she has further deteriorated since my last visit. The winter months will take their toll, but why should I care? I cannot tell. 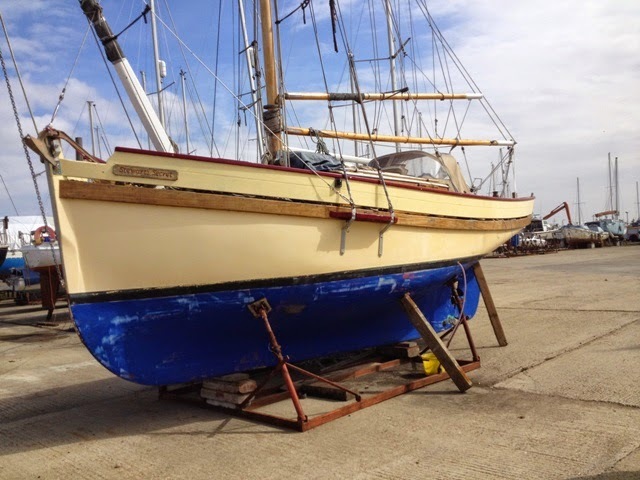 Perhaps it is because I almost bought her, and I most probably would have, had I not bought ‘Sandpiper’, my ‘C’ Class West Wight Potter prior to having my ridiculously low offer accepted. Despite her oddities, I am still beguiled by her, and yet at the same time, I know I shall never own her. 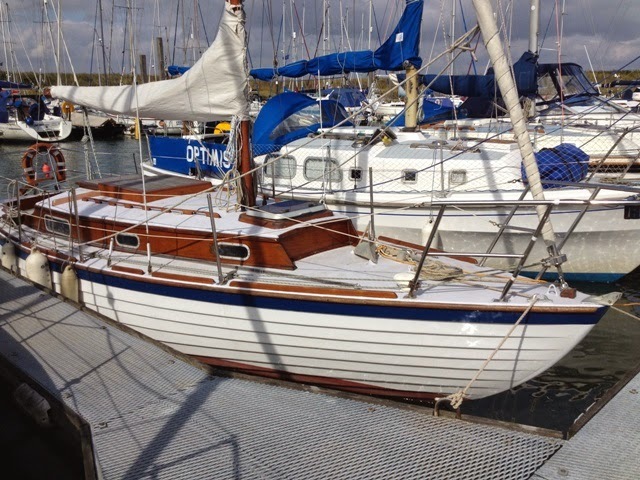 I just wish someone would buy her and take care of her, even it she is a pig of a boat. Rules are not the same as commands. When I was in the army I was subject to the commands of those above me. Being a Lance-Bombardier, with one stripe, I was able to give an order to a subordinate, i.e., any private. There was a chain of command - each soldier being under the rank of one above, up to the equivalent of today’s Chief of the General Staff, similar to a system of line managers. 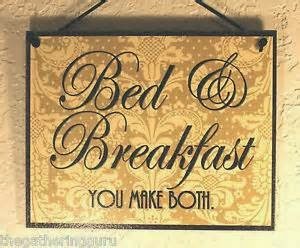 Rules can be broken, but commands by their very nature are not to be broken. When a command is broken, those in authority and power can impose penalties or sanctions upon the disobedient. In some cases when rules are broken, such as ‘School Rules’, those making them have authority to impose punishments. We can make up rules as we go along, and change them according to circumstances or at whim, but we are not in a position to ignore the laws of the land. As citizens we are bound by them. If we join an organisation, or work for a company, we accept their rules, and we may be asked to sign up to them. Obedience to rules and commands is essential for the smooth working of any group enterprise. It is essential that members all sing from the same hymn sheet and work together for the common purpose. 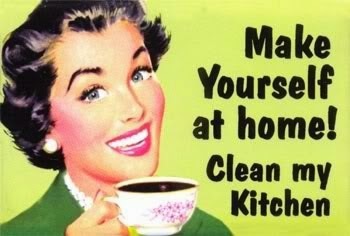 Commands must always support rules and be subject to them, otherwise they are counterproductive. If rules are destructive, the commands will also be destructive. 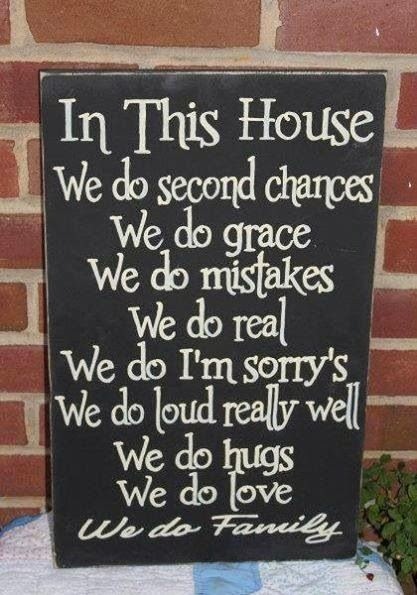 Rules are therefore best when constructive, and they are made for the positive good of an organisation or group, even within a household. Ethical rules are better for the wellbeing of those who are required to adhere to them. 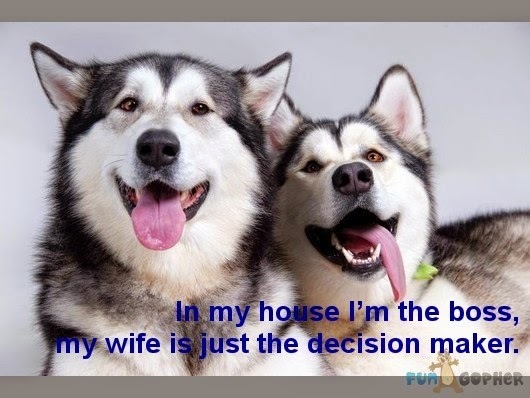 Those who make rules are often the same as those who command others to obey them. A big bully or despot has power to make rules and to command people under his power to obey them. When Saddam Hussein was in power in Iraq he did many bad things, but there was a degree of law and order. He was a bully and a despot. Today, because of a lack of strong government and leadership there is chaos. Isil controls large swathes of land with power to impose their barbaric rules and exercise their commands upon the inhabitants. 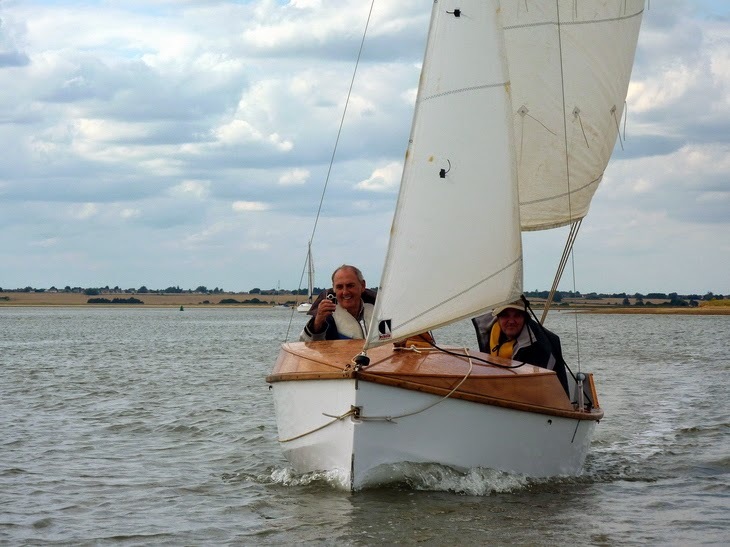 In yesterday’s article, ‘More than a Concept’ I used the second definition* of ‘religion’ in the Concise Oxford English Dictionary to make the case that active, keen sailors are religious. Their religion is ‘sailing’. 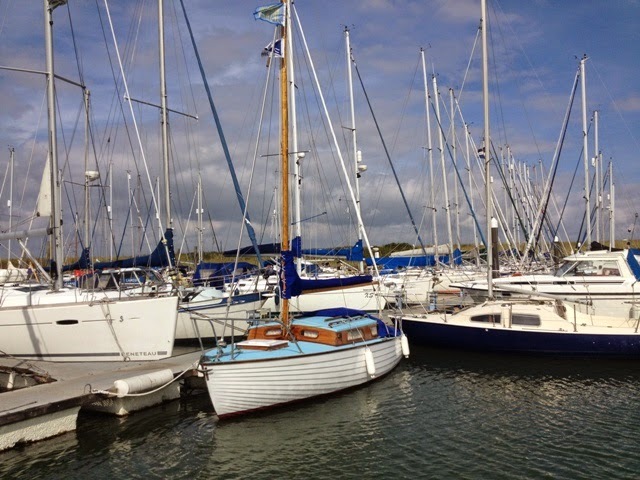 They adore their boats and often devote hours of loving attention to them. In some instances they sometimes part with cash to the degree of making sacrificial offerings for the glory of the vessels they worship. 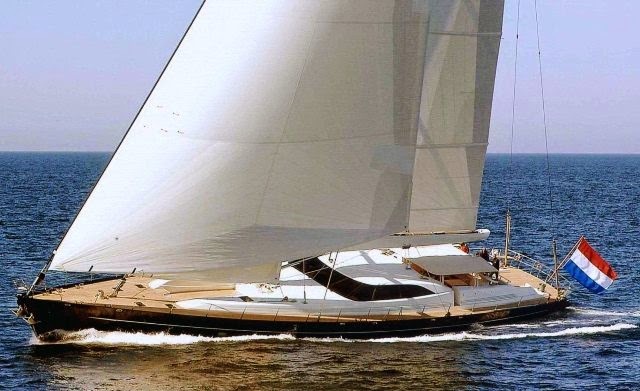 They willingly suffer as paupers to see their prized yachts in pristine condition, ready and able to perform the task for which they were made, i.e., sailing. For these worshippers, adoration is a satisfying experience, but their greatest joy comes from sailing the objects of their adoration. Worship springs from a desire within. The object or god worshiped is cherished and admired. There’s a voluntary and willing response on the part of the worshipper. In the case of a boat being the object of worship, there is no reciprocal response, for ‘she’ does not have life, but in the case of the One and only living God, because He has life He can respond. Indeed, He can initiate and solicit a response from a would-be worshipper. This is the way of the God of the Universe who calls all men and women to worship Him. What sets us apart from Animals? Is it Boats? Religion as defined by different dictionaries can be so diverse as to cause confusion as to what it is. The Concise Oxford English Dictionary gives only two definitions, the second of which is very broad: ‘a pursuit or interest followed with great devotion.’ That includes almost anything that excites and inspires us to willingly expend energy studying and practising the subject of our worship - For a religion requires practice. A religion is something that is done. 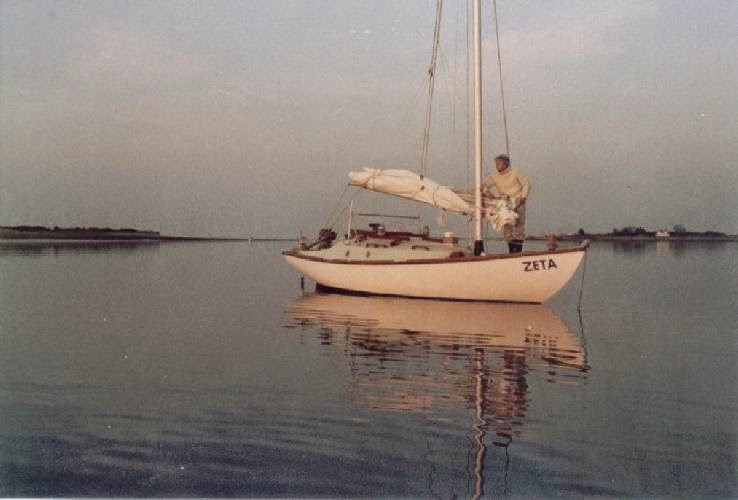 Within this definition, the study and practice of sailing and cruising small sailboats is a ‘religion’, and as with other religions there are those who study, but do not practise, and those who do both. One can be enthusiastic about the nature or concept of a belief, and yet have no real desire to put it into practice. There are those who say they are Christians and actually believe they are, and even claim they are, and yet in reality they do not do what Jesus teaches. They accept the concept of Christianity; they love the idea and principles, but that’s as far as it gets. They are religious, but they do not ‘do’ what is required of them. They do not obey the commands of the One they purport to love and worship. I find the same is analogous with a number of those who say they are ‘members of the sailing fraternity’, and they say they want to do this or that. They may claim it is their desire to sail around Britain, or to cross oceans, or even to live on a boat so that they can cruise when they like, but the extent of their ‘religion’ is shallow, little more than a concept. Academically, they may devotedly study their interest, and in so doing they are religious, but they never get around to actually doing what they say they want to do. They find excuses. 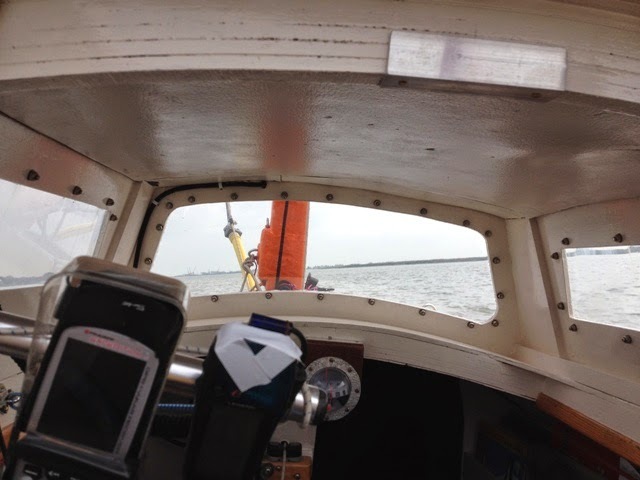 I’m not trying to belittle those who go no further than study a subject, for there can be great merit in doing so, but I want to point out that there are dream sailors who never sail, and the reason for this is that they have no real desire. I have gone full circle. I had the desire. I made the effort and did what I was able, and I reaped the rewards of satisfaction and fulfilment. Now I am contented, and my lack of desire is fully understood in my contentment. My religion was more than a concept. 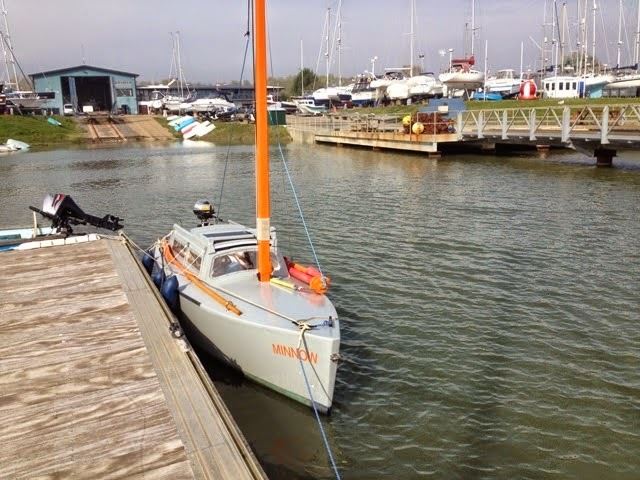 I saw this gaff cutter at Titchmarsh Marina. 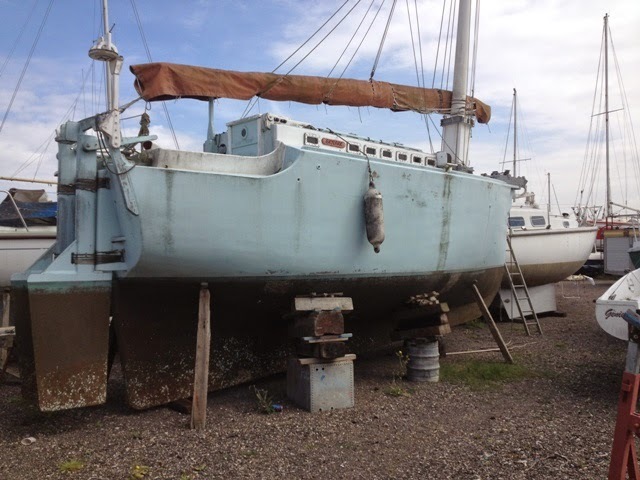 I believe she is a replica GRP smack. 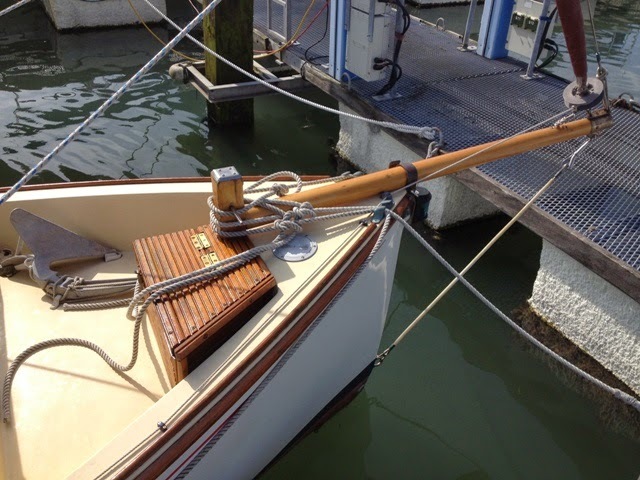 Her topsides appear to be rather too smooth for painted wood, because there are no signs of caulking between planking. 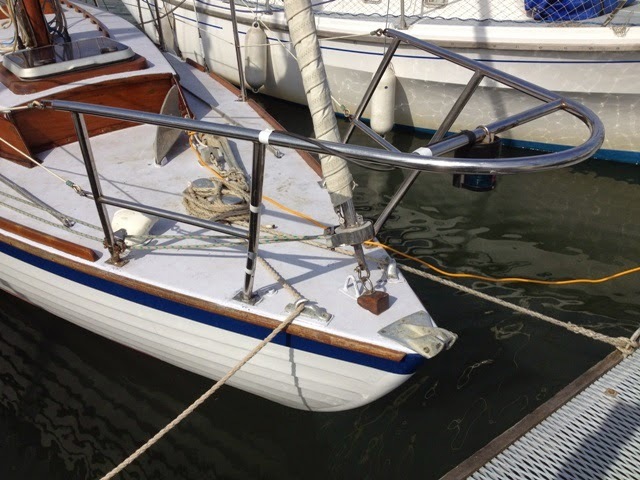 She has a stout bowsprit, but the girth of her yard and boom seem inadequate for the forces they may have to bear, especially with a severe gybe. 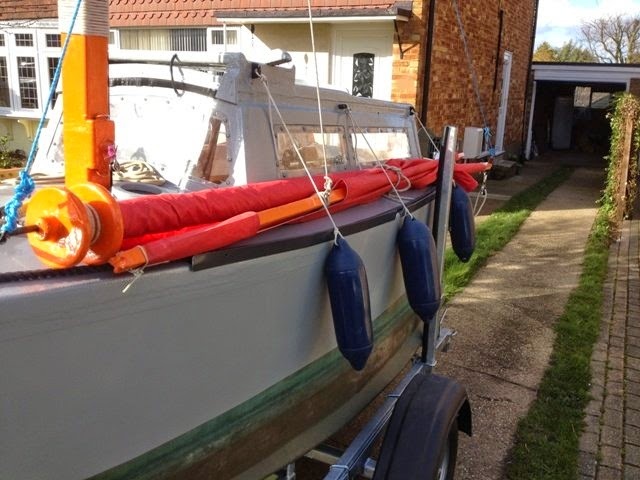 Likewise, her chainplates are not robust enough for a genuine working boat. 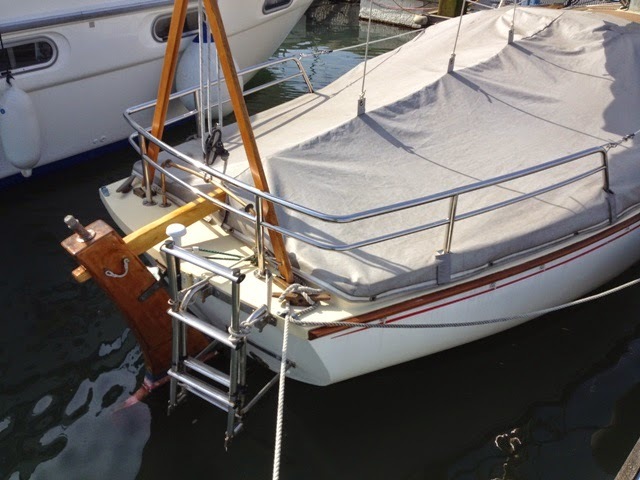 She has the scantlings of yacht, rather than a smack. Now, I could be wrong in all of this, but that’s the impression I have.